It is necessary for all activities having to do with water transport and the opening and closing of the stomata. Potassium takes care of the strength and the quality of the plant and controls countless other processes such as the carbohydrate system. Potassium takes care of the strength and the quality of the plant. Controls countless other processes such as the carbohydrate system. Dead edges on the leaves. In case the EC in the substrate or potting mix is high, you can rinse it with clean water. Evaporation is reduced if there is a shortage of potassium. A consequence is that the temperature in the leaves will increase and the cells will burn. This occurs mostly on the edges of the leaves, where normally, evaporation is highest. Tips of the younger leaves show gray edges. 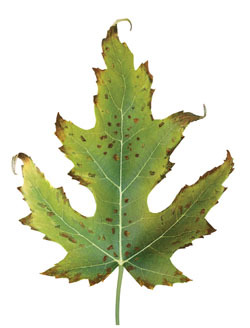 Leaves turn yellow from the edge in the direction of the veins and rusty colored dead spots appear in the leaves. The tips of the leaves curl up radically and whole sections of the leaves begin to rot. The leaves keep on curling and ultimately fall off. An extreme shortage produces meagre, unhealthy-looking plants with strongly reduced flowering. Too little, or the wrong type of fertilizer. Growing in potassium-fixed potting mixes. An excess of sodium (kitchen salt) in the root environment, as sodium slows down potassium intake. In case the EC in the substrate or potting mix is high, you can rinse with water. Add potassium yourself, either in inorganic form: Dissolve 5 – 10 grams of potassium nitrate in 2.5 gallons of water. In acidic potting mixes, you can add potassium bicarbonate or potassium hydroxide (5ml in 2.5 gallons of water). Add potassium in organic form: Add a water solution of wood ash, chicken manure or slurry of manure (be careful not to burn the roots). Extracts of the grape family also contain a lot of potassium. Potassium is absorbed quickly and easily by the plant. In a hydroponic system results get visible within several days. Potassium supplementation by leaf fertilization is not recommended. Too much potassium will cause salt damage, calcium and magnesium deficiencies and acidification of the root environment!